Today, we are pleased to welcome back guest author Sarah Kay Bierle. Generals oversee battles. Soldiers fight. Civilians hide. Surgeons amputate. What does a medical director do during a battle? More specifically: what did Dr. Hunter McGuire do at Gettysburg? The medical director of the Second Corps of the Army of Northern Virginia is elusive to historians seeking to understand his role in the medical situation at Gettysburg. In the history books, he appears and then he’s gone, leaving readers with only a few facts and too many questions. However, the details gleaned from comrades’ accounts and his own writings from other battles allow us to partially reconstruction Dr. McGuire’s Gettysburg experience. This game of hide and seek with historians probably isn’t the good doctor’s fault. Dr. McGuire kept journals and papers detailing his experiences in the Confederate service. Unfortunately, those valuable documents were burned near Waynesboro, Virginia, in the spring of 1865 when Yankee cavalry captured the baggage wagon and gave no thought for the poor historians a century and a half later[i]. Additionally, the Southern medical records stored in Richmond also disappeared in flames a few weeks later. Thus, with the most valuable primary sources destroyed, only fragments of McGuire’s Gettysburg experience remain, enough to fascinate, inspire the imagination, and awaken respect for one of Virginia’s finest sons. As General Lee’s army began the march northward in early June 1863, twenty-seven year old Hunter McGuire was ready to move forward. The last month had been filled with grief: the wounding and death of General “Stonewall” Jackson. The general’s injuries had seemed to heal, but pneumonia – a dreaded disease, still unconquered by 19th Century medicine – had claimed the tenacious warrior’s life, despite every effort Dr. McGuire had made. The following days had been torturously busy with funeral preparations and travel, and then it was over. The sorrowing hearts tried to heal. Returning to the army, Dr. McGuire had offered his resignation from staff to the new commander of the Second Corps: Richard S. Ewell. General Ewell refused to accept any of the staffs’ offers to depart, and McGuire and his friends settled into their routine tasks for the new commander. Ewell and McGuire were already acquainted; McGuire had amputated the commander’s shattered leg after the Second Battle of Manassas in August 1862. The Second Corps led the advance through the Shenandoah Valley. This was familiar territory to McGuire. Growing up in Winchester and fighting an entire campaign here last year with General Jackson made the farms and towns welcoming and memory-filled to the doctor. They approached Winchester – McGuire’s hometown – held in the iron grip of Yankee General Robert Milroy for the last six months. A smashing attack by the Second Corps resulted in the 2nd Battle of Winchester (June 13-15, 1863), the liberation of the town, and McGuire’s brief reunion with his mother and sisters. Then northward again. Crossing into Pennsylvania in mid-June, the Second Corps spread out through the southern part of the state. General Ewell, staff officers, and some troops arrived in Carlisle where McGuire tried to obtain medical supplies – specifically, chloroform and amputating instruments. Morale in the Southern army was high at this time, and McGuire took part in the festivities in Carlisle, attending a Confederate flag raising ceremony. While touring a college facility, he was angered by a chemistry professor’s political remarks and subsequently attempted to confiscate his lab equipment as revenge for Yankees looting College of William and Mary in 1862[ii]. But the jolly times in Carlisle did not last long. Unable to establishing a crossing at the Susquehanna River, General Lee started recalling the troops, converging at a crossroads town called Gettysburg. On July 1st, the Second Corps approached Gettysburg from the north, coming into a fight that had started hours earlier. The troops entered the battle area, confronting the Union XI Corps which broke and retreated in the late afternoon. The casualty toll for the Second Corps was comparatively light on this first day, but as darkness descended and the Confederate troops moved toward a new position surrounding Cemetery Hill and Culp’s Hill, Dr. McGuire was hard at work overseeing the care of the wounded and preparing for the aftermath of the next day’s fighting. 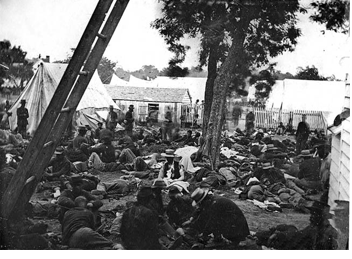 Field Hospital scene often encountered by McGuire. Hunter McGuire was the medical director for the Second Corps, but what does that mean? First, he was on the commanding general’s staff. Second, he was in charge of the health and physical well-being of the troops and officers…and that required a lot of work. Some of McGuire’s duties included a daily report on corps health, inventory of medicine, bandages, and other supplies, insuring the competence of the surgeons caring for the soldiers, choosing field hospital locations during a battle, tallying and reporting casualties, and performing operations requiring special attention or skill[iii]. It was not an enviable position. The work was hard – physically, mentally, emotionally – and surgeons were not immune to dangers from disease or bullets. McGuire had already had a least one bout of serious illness earlier in the war, and he knew the dangers of the battlefield, but would escape the war without serious injury. During the next two days of fighting at Gettysburg, elusive McGuire was fulfilling his duties with such dedication that he is forgotten…almost. If he had made a disaster of his tasks, he might have been scolded in a report, but he did his duty with characteristic precision, guaranteeing the injured Confederates of the Second Corps received the best medical care possible. The Confederate field hospital locations for the corps – usually homes or barns – to the north of Culp’s Hill, Cemetery Hill, and part of town were probably chosen by McGuire. These locations were usually a couple miles from the actual fighting; the wounded would receive basic care and then walk, stagger, or go by ambulance to the field hospital for operative care. In other battles, McGuire was often found overseeing the removal of the wounded from the field, riding briefly with the commanding general, working in the hospitals, and checking on his surgeons’ work, and this was probably his task and role at Gettysburg. Dr. McGuire’s other well-documented action at Gettysburg was the amputation of General Isaac Trimble’s leg. Some readers may be most familiar with General Trimble from his “interview” with General Lee shown in the film Gettysburg. Actually, Trimble was the general nobody seemed to know what do with. Wounded at Second Manassas, he rejoined the Confederate army during the Gettysburg campaign, only to find his former division in the hands of another general. 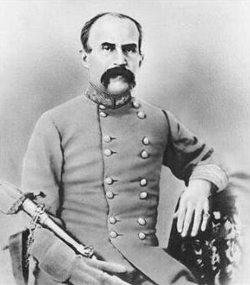 In an attempt to keep the peace around headquarters, General Trimble was attached to the Second Corps as a military aide. That didn’t turn out well, but General Trimble eventually got what he wanted: to lead an infantry attack. On July 3, his new, temporary command – two brigades – was part of Pickett’s Charge, and the unfortunate general received a bad leg wound. In the parlor of Samuel A. Cobean’s home, Dr. McGuire removed the general’s leg and left him to recover in the civilian house[vi]. General Trimble might be called lucky; he did not have to endure the slow, agonizing ambulance ride back to Virginia when the Confederate army retreated. During the nights of July 3rd and 4th, Dr. McGuire oversaw the removal of the wounded from the battle area and made the necessary decisions regarding which soldiers could be moved and which had to stay. The entire Confederate army lost about 27,206 men – dead, wounded, or missing[vii]. The Confederate ambulance train was seventeen miles long[viii], transporting nearly 6,000 wounded back to Virginia…and they had still left approximately 5,500 injured at Gettysburg[ix]. Did McGuire retreat with the wagon train or with the officers of the Second Corps? That has not been determined yet. Either answer is probable, but it seems very likely he would have gone with the wounded. The wagon train received priority when crossing the Potomac River, and by July 7th the wounded were arriving in Winchester, Virginia, where they were received into civilian homes and hospitals or sent farther south to Staunton. For Hunter McGuire, Gettysburg was not much different from other battles. There were field hospitals to oversee, injured officers needing assistance, and nightmarish logistics for transporting the wounded. While specific details are scant, there can be little doubt Dr. McGuire ensured the best possible care for his wounded troops by quietly fulfilling his duties. What can be learned from the elusive doctor at Gettysburg? The importance of quietly and efficiently attending to work and duty. McGuire did not seek glory or honor for his work. He wasn’t leading attacks or rounding up prisoners and wagon trains. He was where he was supposed to be. Perhaps we’ve missed some of the real heroes of Gettysburg because we’ve focused on the killers rather than the saviors. You can walk the route of Pickett’s Charge or trace General Stuart’s sideshow adventure which may seem more exciting than trying to follow the footsteps of a doctor at Gettysburg. Whose steady hands staunched bleeding wounds? Who chose the locations for safe refuges and sent the skilled doctors? Who saved life? Perhaps the heart and character of the man is most important than monuments or precise battlefield footsteps…and Dr. Hunter McGuire selflessly, silently, and skillfully labored so his men would live. [i] John W. Schildt, Hunter Holmes McGuire: Stonewall Jackson’s Surgeon, (2002), 106. [ii] W.G. Bean, Stonewall’s Man: Sandie Pendleton, (1959), 136-138. [iii] John W. Schildt, Hunter Holmes McGuire: Stonewall Jackson’s Surgeon, (2002), 11-13, 20-27. H.H. Cunningham, Doctors in Gray: The Confederate Medical Service, (1958). [iv] Gregory A. Coco, A Vast Sea of Misery: A History and Guide to the Union and Confederate Field Hospitals at Gettysburg, (1988), 119-120. [v] Henry Kyd Douglas, I Rode With Stonewall (1940), 250-253. [vi] Gregory A. Coco, A Vast Sea of Misery: A History and Guide to the Union and Confederate Field Hospitals at Gettysburg, (1988), 125-126. [vii] Edward J. Stackpole, They Met at Gettysburg, (1956), 284. (Referenced from official reports). 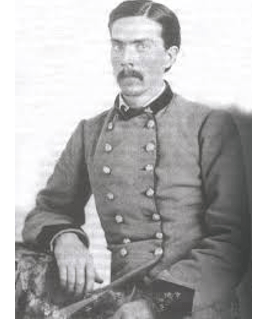 [viii] John W. Schildt, Hunter Holmes McGuire: Stonewall Jackson’s Surgeon, (2002), 90. [ix] Gerard A. Patterson, Debris of Battle: The Wounded of Gettysburg, (1997), 3. This entry was posted in Armies, Battlefields & Historic Places, Battles, Campaigns, Civil War Events, Common Soldier, Leadership--Confederate, Memory, Personalities and tagged Battle of Gettysburg, Culp's Hill, Dr. Hunter McGuire, Gettysburg movie, Henry Kyd Douglas, Hunterstown Road, Isaac Trimble, Richard Ewell, Robert E. Lee, Robert Milroy, Second Corps, Second Manassas, Second Winchester, Stonewall Jackson, Winchester, XI Corps. Bookmark the permalink. This is true for almost every doctor/surgeon/assistant surgeon/orderly/stretcher carrier/nurse in the Medical Corps on both sides. “Selfless” takes on whole new depth of meaning when one studied Civil War medicine. By G’burg, both sides had pretty much sorted out the wheat from the chaff, but the South had a much more difficult job of it than the North. Being so far from any reasonable base of supply has many dangers for medical folks. Plus, no matter how rational and orderly evacuation plans seem when read, remember the circumstances surrounding them. That, and this–no matter how well battlefield triage worked, hurt and ill men were still at the mercy of bad medical practices. Not “bad” in that someone was lagging, but bad in that it was 1863, or “pre-Lister.” No amount of skill made up for infections, and poor health and hygiene. Thanks for this insightful look into the Confederate Medical Corps.